Unreal Tournament 3 on PC, beta testing a map that someone else was working on (an RC1 beta of DM-HardFall, I believe it's called), and looks like it's worth the while. Can't wait for the final version of it. Games are short? Are you serious? I honestly don't have 20 hours of time to throw at a game... so to me any game over 6 hours (a couple days of play) is long. Depends on your perspective I guess, 6 hours is pretty short to me, almost episodic. Of course because of this new DLC trend, if (PC) games are available retail at all they'll get shorter and shorter and you'll have to pay extra to download more of the same. 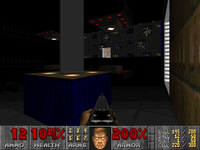 Duke Nukem 3D . I havent been gaming much lately. Just finished the Classic Doom 3 mod, it was really a good Doom 3 makeover to the vintage "Knee-Deep in the Dead" episode. I hope we see more from this team soon. I'm still playing through Half Life II Episode One! Playing through Gears of War 2 and did a bit of Halo ODST. Wasn't much fond of the Halo game. All the cityscapes looked the same. I was crying out for some roaming pig cops and some man hole covers you could jump down! Gears of War 2 is pretty cool. I got UTIII through steam for a rediculously small amount and have been enjoying it immensely. I thought it would be crap after the debacle of the launch, but they seem to have got it together. I thought that Steam were doing a crazy offer but I went into my local game store and found it for Xbox 360 for less then ten. You're right...UT3 is rather good, although I still feel that UT2004 was more fast paced, and had more features than UT3 did, but with the newer graphics and physics, there may be some advantages with UT3 over UT2004, and some of those gameplay modes are making a comeback through mods that are out there, so...that made it somewhat worth the upgrade. 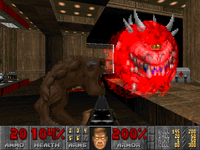 Anyway...ran ZDoom, playing through a map that I built way back when off a floppy (finally got around to getting an external floppy drive so I could actually load it in). I stayed away from UT 3 after a number of problems I had with new PC games. I downloaded the demo and it actually blue-screened my rig, which I don't ever remember happening before with anything. The web was alive with problems, then literally at the end of that week it went gold. I thought "Did they REALLY try to fix any of these bugs?" So I stayed away. This is at the same time that I was trying to play Gears of War I on the PC and running into the infamous save game bug that Epic still haven't bothered fixing. So I kind of got put off new PC games. This was a real shame as I played UT2004 and 99 pretty much till the CD's wore out! Just after that my graphics card died, and shortly after that, my rig died completely. Recently my lady got me a new rig with a decent graphics card so I've been kinda celebrating. Steam had UT3 on offer for something stupid so I said "f*ck it" and got it down. Kind of to my surprise, it works like a charm! So now I'm coming back to gaming. Playing Deus Ex: Invisible War and am enjoying it, how about that. Too bad you can either have cloaking òr the ability to hack and not both, but I wanna do it stealthily so I'm sticking with cloak (though I do have a spare biomod canister if I ever REALLY need hacking). But hey I'm up to Cairo now and I have only killed a few Order troopers in the first level of the game, apart from that I haven't killed or hurt anyone and only used my pistols to break some special glass. Just got around to installing Mass Effect 2 (about time that package showed up...Newegg and UPS were taking their sweet old time getting it here, supposedly). 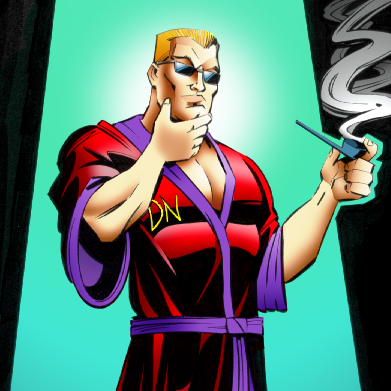 Finished Duke Nukem 64 for the Nintendo 64 recently. I played it a few years back but never finished it so I decided to do it now, although it was mostly due to wanting to see the major differences between DN3D and this. I actually liked it despite it being heavily cut in terms of sexual content. I liked the new weapons, especially the dual sub-machine guns and grenade launcher, but at the same time I wondered where the hell the Devastator went; the lack of it made the boss battles more difficult of course, which isn't a negative point per se but it was a great weapon to use for cleaning up rooms really quick in the original game. A few maps in the game were expanded upon from their original counterpart; some were okay for the most part but one that really stood out was "Rabid Transit"; instead of the circular transit system in which the trams go around endlessly in the original game in this there's only one tram and it goes back and forth between two points. You still have to run on the track but it's been made much easier thanks to the linear design and greater lighting. The scale of the map is also much larger with it having even a second, although non-functional nonetheless, track. Other maps included that was expanded upon were "Fahrenheit", with the fire station interior actually looking like a fire station; "Freeway" having a part of the "Pigsty" map from AE integrated into it and "Flood Zone" having the yellow key card in a entirely new and different location. Yeah, have yet to do more with DN Total Meltdown myself, might as well fire up the PS3 and pop the game in sometime soon. Should be interesting to see what the extra content of DN:TM is vs. that of the PC version myself... Do you think that DN64 had more or less than TM for PSX, or than the PC version for that matter? Unfortunately I have yet to play DN:TM; however I have always wanted to so that's one of many priorities in my life to get a cheap copy of it somewhere. Either way, TM did in fact have an entirely new episode and new enemies while DN64 instead had new weapons while replacing a few of the original ones. Hard to say though since I haven't played TM but ultimately I'd say DN64 was pretty decent with the extra content; compared to the PC version many levels in the game went through some changes, some minor to even significant changes; being able to rescue cocooned babes instead of having to kill them; new weapons as mentioned such as sub-machine guns, grenade launcher, missile launcher and the plasma cannon. However, there were also parts that was cut such as no BGM while playing; not all maps from the PC version made it into the game and obviously the more notorious cut being that there's no sexual content to be found in the game at all. I've read though that TM didn't have any split-screen co-op or multiplayer (unless you linked two PSX's together with two copies of the game) which DN64 had right out of the box. Wow that pic is spooky! Duke 3D in between spurts of writing and animating. Played some Conquest : Frontier Wars with my brother this last saturday. Was thinking of giving the ol Commander Keen games a whirl. Havent played them in a long while. Why yes... That is exactly what I meant. Really? then is it worth buying? Hmmmmm i'm not sure if your being sarcastic there m8. You were being "series" WTF! How can you edit if your keyboard died? An on screen keyboard? wow!